Mumbai: About seven years ago, when Sameer Sain was raising funds for Everstone Capital Management’s second private equity (PE) fund (Everstone Capital Partners II), the former managing director at Goldman Sachs Group Inc. got turned down by an investment manager of a university endowment fund who came very close to making an investment but eventually balked. The endowment fund chose a lesser- known rival over Everstone, the investment management firm Sain founded with his former Goldman Sachs colleague Atul Kapur in 2006. The decision baffled Sain and Kapur. A few days later, in a casual meeting in Hong Kong with the investor, Sain found out the reason. It wasn’t what they expected. “I get the feeling that you and Atul are too Goldman Sachs, very confident, in your expensive suits and watches, you seem to have an articulate answer for everything. Basically you come across as too slick while the other guys seem more real and humble," was what the manager told them. Since then, Sain has more than proved his fundraising prowess. Everstone has assets under management in excess of $3.3 billion across PE and real estate. This, in a short span of 10 years, is no mean achievement. The rise of the firm has certainly caught the eye of peers and the perception is that Everstone is a fundraising machine. Sain disagrees. “The perception that we are a great fundraiser is wrong," he says. “The marquee global LPs (limited partners), many of whom are our investors, are much smarter than you think. They are committing to a manager in a blind pool for a very long time with no liquidity. A lot of work and thought goes into the decision on which manager to back." “I would be a great fundraiser if I had a seven- or eight- person team, sat in a small office with minimal infrastructure and skin in the game, and then raised $3 billion. Currently I would say I’m a poor fundraiser: I put more money in my funds than almost all my peers, I have the largest team of talented people with whom I share economics, five offices with massive infrastructure and overheads, and a very stable, solid firm," adds Sain. “All the players in our industry charge the same fees but each one is very different. It’s analogous to all the cars in the showroom being the same price. At Everstone we have built a Ferrari but we charge the same as someone offering a Fiat. And yes, I accept that a Ferrari is slick," quips Sain, taking a jibe at that investment manager while recounting the incident. “Atul and I are not going to apologize," he says, adding, “We have years of strong experience at a global firm like Goldman Sachs and almost 100% of our own hard-earned money is invested alongside our investors." There is merit in what Sain says. The duo, who quit their jobs at Goldman Sachs in 2006 to start Everstone, have invested several million dollars of their own in their funds. In addition, they have invested a huge amount on their platform and on talent. Such commitment is seen as a stamp of faith in the asset management industry and goes down very well with limited partners (LPs), or the investors in a fund. “Skin in the game", as it is referred to in industry parlance, is fast becoming a norm and being embraced by quite a few fund managers. But the quantum of their personal commitment definitely stands out. “Atul and I both worked at Goldman Sachs for 11-12 years each. We met back in 1994 and have been close friends since. We always had the ambition to become entrepreneurs and start our own firm and were lucky that we worked at a meritocratic firm where we did very well and were compensated accordingly. In addition, like many of our peers, we benefited from shares and options when Goldman went public and thus had sufficient capital at an early stage in life to go and take some risks," says Sain. In 2006, the two partners set up two businesses—one was an asset management business, dealing in PE and real estate; the second was a financial services business. “We did both in partnership with the Future Group. I had an old family relationship with Kishore Biyani and that is how we started this business," recalls Sain. The relationship, however, did not last long. He adds: “A couple of years into this partnership we took Future Capital public, but we had a different view of how we should proceed in life. So, in a very amicable way, we parted ways. We bought out their share in the asset management business. Over time we started to sell our shares in Future Capital in the market. Eventually that business got sold to Warburg Pincus. “We brought the brand of our overseas business (Everstone) to India and rebranded our operations here and eventually became one regional brand—the Everstone Group," says Sain. A broken relationship is now a thing of the past. It was, in fact, the genesis of the entrepreneurial powerhouse in the making and one which already has global aspirations. “Everstone is only 10 years old. We started in a small office in London where Atul and I were based. Very quickly we opened five offices (Mumbai, Singapore, Bengaluru, Delhi and Mauritius). Ironically, we shut London eight years ago and physically moved to Asia. Next month, after so many years, we are about to open an office in London to support some cross-border investments and business development," says Sain. Everstone has four lines of business today: PE, real estate, credit and consumer venture. “We are over 200 people across five offices. Headquartered in Singapore, regulated by the Monetary Authority of Singapore (the country’s central bank). Atul and I are both residents of Singapore. The largest office is Mumbai where we have about 80-100 people. And we have a very stable firm, which we have built very carefully over the last 10 years," says Sain. While Sain and Kapur are the co-founders of the business, it already has a second and third layer in place. “Everstone has built a highly institutionalized platform which operates like the corporate nerve centre of a business group," says Dhanpal Jhaveri, a managing partner who leads the firm’s PE business. Rajesh Jaggi is managing partner of the real estate business. At the other end of the spectrum, P.M. Devaiah, a partner and general counsel, leads a team of lawyers to ensure that the firm is well protected and functions smoothly. “We have a lot of trust and faith in each other. As an example, Rajesh Jaggi is not only my partner but also the best real estate investor and developer in India. I trust him 100%, so why should I second-guess him. This trust and culture brings out the best in our people and allows them to excel," says Sain. PE is essentially a business by the LPs, of the LPs and for the LPs. And what do LPs really want: GPs (general partners) who can repeat and institutionalize success, who can build consistency, legacy and an institutional framework for repeatability, who can incentivize the team well for a long-term alignment, who have the “desire to be successful" as opposed to just being “transaction oriented" and those who have good infrastructure for effective LP communication. 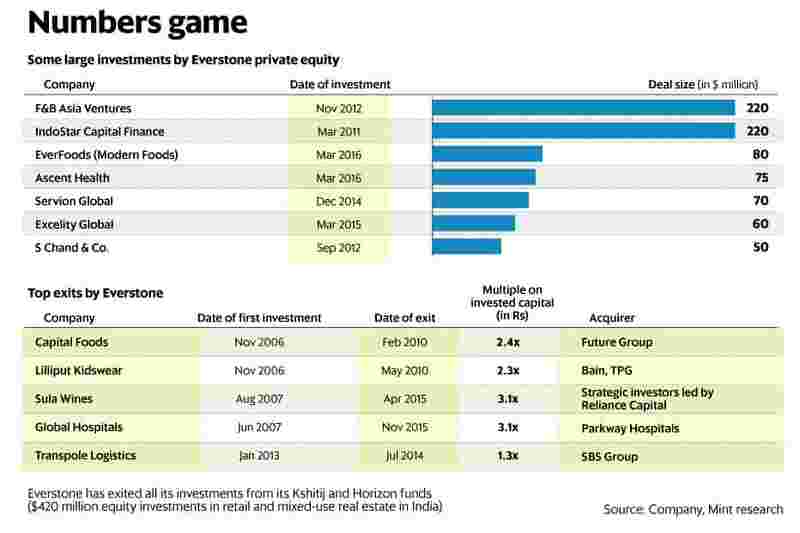 “Everstone is building its private equity business in an institutional manner. We have not seen many private equity firms do this. They think along the lines of building long-term businesses, which we like," says Nupur Garg, regional lead (South Asia) at International Finance Corporation (IFC), part of the World Bank group. IFC is one of the biggest global investors in India, backing roughly two-thirds of the active growth funds investing in unlisted small and mid-cap companies. Also, diversity is a key ingredient in the Everstone talent mix—multiple nationalities across its various offices with 30% of its senior team comprising women (seven out of 24 managing or executive directors). The women too have a multinational and global background like Roopa Purushothaman, a former Goldman Sachs senior economist, and Bhavna Thakur, a former director at Citibank and a qualified international lawyer. “Everstone’s ethos of being a business builder adds intrinsic value to our portfolio companies by providing leverage to the portfolio in every aspect of business: whether it be research, branding, marketing, operations, capital markets or mergers and acquisitions," says Thakur, Everstone managing director for capital markets. “This enables strategic alliances and market intelligence." Within PE, the firm uses the brand Everstone Capital which is currently investing out of its third fund. The first fund was in partnership with Future Group and called Indivision. 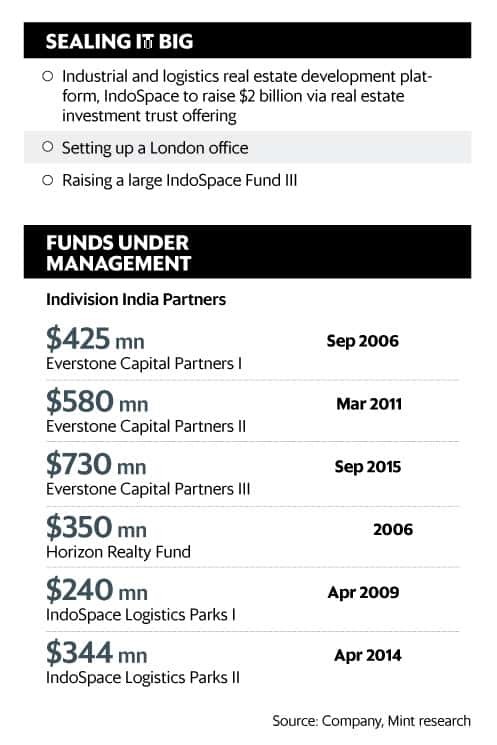 The second was Everstone Capital Partners II. The third is Everstone Capital Partners III. The firm currently manages about $2 billion and about $2.3-2.4 billion in actual investments made, including the co-investments. Like any PE firm’s portfolio, Everstone also has its share of the good, the bad and the ugly. “We have our share of challenges from the first fund while fund II is in great shape. We have some fantastic businesses in there, some real winners, including businesses such as IndoStar Capital, Hinduja Leyland Finance, S. Chand and Ozone Overseas. Fund II is going to end up being a strong performer and fund III has gotten off to a good start," says Sain. He is candid about the first fund’s portfolio and admits that it was a learning curve for them. “Future Group’s e-commerce—the first e-commerce business we backed with Sherpalo and Kleiner Perkins. Probably too early, it’s almost never that a bricks-and-mortar operator enters e-tailing and beats an independent e-commerce player. We thought it would be different in India but we were wrong. Billimoria & Co. was a massive disappointment too. There was a time we could have sold that business for three-four times our investment but in my view we took a bet on the wrong people, besides the cycle was bad for all EPC (engineering, procurement and construction) companies. So we sold that business, we lost half of our money. Moved on," says Sain. Bad bets are part of the game but seeing Sain being candid about them is unusual in the world of PE. “Both Atul and I have a mindset of control and execution. We shifted that in our first fund because the idea was to go buy into consumer businesses as minority and work with our ex-partner (Future Group) to provide them a distribution platform," he says. “So we went back to our roots to do what we knew best. Buy businesses, roll up your sleeves and get things done. Execute and build businesses—as we have done with Burger King, ReGen Powertech or with IndoStar—but never ever ignore that there are great people and franchises out there who you can trust and back," adds Sain. Sain is on top of every minuscule activity happening at these firms. He takes out a mobile-like device from the pocket of his blue jacket and takes us through a dashboard on screen where you can see every live cash transaction from every terminal in every Burger King outlet in India. “We control the brand of Burger King for almost 20% of the world population," asserts Sain, his face lighting up with the sheer joy of ownership. “There are businesses that we like to control but these businesses need to have science behind them. We bought Modern Bread from Unilever. It came with 60,000 distribution points. Its been a phenomenal one-and-a-half years of headache. We had to carve out the factories, people, the labour union. How many people in India can do that?" he says. “No CEO/CFO, a strong labour union, manufacturing plants in seven different locations and a non-cohesive business culture. We played a video in eight different languages at eight different manufacturing plants about the Everstone Group— to appeal to the factory workers about how their future will be bright with us. (To tell them) what our ambitions were and how we will take the brand back to its glory days," points out Sain. Now that the hard work is done, it is beginning to bear fruit. “We will do cakes, rusk, cookies and other baked goods. We are going to grow that and make Modern into a Rs2,000-3,000 crore business," he says. But then there are always some businesses which have more art than science to them. Which is where minority investing comes in, says Sain. He says: “That’s my view on minority/control. It’s art vs science. If you look at fashion or winemaking, these businesses have a lot of art embedded in them. We own 34% of Ritu Kumar, where design and product selection plays such a vital role. Take Sula, for example. Winemaking is an art and Rajeev Samant is the best at it. That is why we made extraordinary returns by backing Rajeev and eventually exited that business. In such cases, our role changes to a minority investor who provides capital and business discipline. “Within food itself—we own and control Burger King in India—quick service and fast food is largely science with a big focus on quality, supply chain and customer engagement. All mostly science and execution, which is why we can own this business but still have an amazing CEO in Raj Varman. On the other hand, we only own 50% of Massive Restaurants and don’t have any day-to-day management involvement. The promoter and creator of this business, Zorawar Kalra, is a passionate genius. At the fine dining level, its art, not science," adds Sain. Everstone Capital has invested Rs1,200 crore in F&B Asia, which has under its fold assets such as Pind Balluchi, Harry’s, the Disgruntled Chef, Pan India Food Solutions (also known as Blue Foods), Massive Restaurants, besides the franchise of Domino’s in Indonesia and Burger King in India and Indonesia, among others. “Blue Foods proved to us very early on—don’t try to run art. Outsource it to the artist and give them the structure and financial discipline to make money," says Sain. Blue Foods operates brands like Spaghetti Kitchen, Copper Chimney, Gelato Italiano, the Coffee Bean & Tea Leaf, Bombay Blue, Noodle Bar and food courts Food Talk and Spoon. “Spaghetti Kitchen was a marque brand, but now with so many new entrants it has become an irrelevant brand. But having said that Gelato is an amazing brand, Coffee Bean & Tea Leaf is the only profitable premium coffee chain in India. Copper Chimney is still an institution. We had to reinvent Noodle Bar. Bombay Blue has a niche following," notes Sain. “Blue Foods is not a problem, but it’s a disappointment that we will not make as much money as we would have liked. We have a phrase we use called ROTI (return on time invested). In the case of Blue Foods, the ROI (return on investment) may be good but the ROTI won’t be great," he points out. Besides PE, Everstone has a very large real estate business primarily comprising a shopping mall business called Kshitij/Horizon and the industrials business called IndoSpace. The shopping mall business was started by Future Group originally but post the separation, this business came to Everstone. “We have funded 14 malls across India, of which 10 have been developed entirely by Everstone. We knew nothing about mall development and learnt it the hard way after we inherited the business. Despite so many mistakes early on, we came up the learning curve very quickly. At the end of the day, we’ve actually completed all of these malls and we have sold all of them. To have built and sold so many malls, I like to think we understand retail and real estate both relatively well," says Sain. “For the IndoSpace business, we partnered with a very good bunch of folks in the US called the Realterm group," he adds. Realterm is an industrial real estate firm that manages approximately $2.5 billion in assets across 300 operating and development properties in North America, Europe and India. “Co-founders Ken and John (Kenneth S. Code and John W. Cammett) are both very similar to Atul and I in both mindset and personality. They are a large logistics and warehousing developer and manager in the US. We have a great relationship with them," explains Sain. The IndoSpace platform has so far raised $584 million across two funds to invest in building logistics parks. These include the IndoSpace Logistics Park I, raised in 2009 with a corpus of $240 million, and IndoSpace Logistics Park II, raised in 2014 with a corpus of $344 million. Using some leverage, the total investment has been almost $1 billion. IndoSpace’s portfolio includes 17 industrial and logistics park projects under operation and development across Mumbai, Pune, the National Capital Region, Bengaluru and Chennai. Its tenants include companies such as Amazon, L’Oreal, Procter and Gamble, Nissan, PepsiCo, DHL, Leoni, Steelcase, Kubota, Ericsson, Bosch, Delphi, Caterpillar, Adidas and Asian Paints. IndoSpace plans to invest an additional $1 billion in the country over the next five years. The additional investment will increase its development pipeline from around 20 million sq. ft currently to 50 million sq. ft.
Sain explains: “Something that is very unique about Everstone is that we buy land, we get permissions, we design, construct, facility manage, lease, asset manage, finance—all in-house. We probably have as much if not more capability than most real estate developers in India. “So, at worst, we are a fully integrated real estate developer. At best, we are a little bit more than that because we are also a fund manager. “But any which way you look at it, the Everstone Group will be among the top five real estate developer groups in the country and one of the few truly national developers given the number of cities in which we operate," he adds. Sain cites growth in consumption and e-commerce, and the unlocking of great manufacturing potential through government programmes such as Make in India, and removing the flux around the goods and services tax (GST) as reasons for its aggressive investment plans in the logistics space. He says: “When people hear of other real estate developers, they talk in awe, but not many people talk about us. We keep a low profile and industrial real estate is hardly a talking point. No one goes to Chakan and says, Wow! Look at this 3 million sq. ft industrial development, whereas you can see a 100,000 sq. ft building in Lower Parel and get all excited about it and that builder gets a lot more prominence. “But we are not here for prominence, we are here to make money for our investors. We are present in 17 cities—from Lucknow and Kochi where we have built malls to Chennai (Oragadum and Sriperumbudur) and Pune (Chakan) where we have developed large logistics facilities. “We are a national developer. We do everything in-house and we have no capital constraints. When you pay fees to a typical real estate fund manager, what they do is go and back other real estate developers with investor capital. So the developer has to make money, the fund manager has to make money and then the investor eventually gets the remainder. With us, the end investor benefits dramatically as we are an integrated developer and fund manager," he says. In the credit business, the group has taken a slightly different approach. Rather than create a credit fund, given their experience with credit at Goldman Sachs, and the fact that they created Future Capital from scratch, they decided to do it in a non-banking financial company (NBFC) format. Sain recalls: “Four-and-a-half years ago, we capitalized a company from zero to about $200 million. We, along with some of our investors put in approximately $120 million and we brought in some partners like Goldman Sachs and Ashmore. We put in a great management team, and added all our experience, risk systems and credit processes. “We started IndoStar with complex corporate lending and today that business segment accounts for over 60% of our Rs6,000 crore book. The rest comes from real estate and SME (small and medium enterprise) lending. The NBFC is looking to increase the SME book to Rs1,500 crore this year from around Rs400 crore last year. Since its launch in 2010, the NBFC’s loan book has grown at an average annual pace of 50%. “For the financial year 2015-16, the NBFC’s revenue increased 22% to Rs644 crore from Rs528 crore in the previous year. In 2015-16, it reported a net profit growth of 29% at Rs192 crore. Its net non-performing asset ratio was at 0.2%. “We started the SME business recently and it has gotten off to a good start. We also recently got our housing finance approvals and are about to embark on secured retail lending. Our real asset always remains our talent. That has always been the key to our success," explains Sain. Everstone’s fourth business and one which is less known is its early-stage venture capital business. “It is a specialist business; it has a lot of art in it. In early-stage venture capital, because there is so much art and because the deal sizes are very small, we have adopted a slightly different approach," says Sain. He explains: “We have formed an equal joint venture with Deepak Shahdadpuri, who we believe is the number one consumer venture capital investor, not just in India but also in South-East Asia. His track record is spectacular and we trust him 100%. Deepak runs DSG Consumer Partners with total independence but he has the entire Everstone ecosystem and platform at his disposal. “It is very unusual to have such a small fund (first fund was $22 million of which $4 million was Deepak’s and our capital) and be able to even afford decent office space and a team. But Deepak has five offices, a lot of talent, full infrastructure, total support so he can do what he does best—make great investments and nurture his young companies. For the investors in such a small fund this is an amazing proposition. Huge skin in the game with such a significant investment from the managers, a large stable platform, yet the art and nimbleness of an early-stage venture fund. Once again, a Ferrari for the price of a Fiat!" he adds. According to Sain, their early-stage thesis has worked out really well. They are among the earliest investors in companies like Oyo, Mswipe, Veeba and Indialends. Over 70% of invested capital has been realized after just one whole and one partial exit. The fund is on track to deliver strong returns. “That fund is on track to deliver a five-seven times multiple of capital in a relatively short period of time," he says. The early-stage fund is now about to sell stake in three companies at huge markups. “We are about to sell a small stake in three companies—at 17-18x." It is also out to raise its second fund which is about to close soon. “We are oversubscribed because we don’t want to raise too much money. Out of the $35-40 million, about $5 million is partner commitment between us and Deepak," says Sain. After giving us a clear road map on where each of these businesses is headed, Sain talks about what worries him the most: Perception. Perception about Everstone being great at fundraising and not so good at exits and investment. “This is simply not true. We are the only RE (real estate) fund from 2006 that has liquidated all its investments and returned capital to LPs," insists Sain. He admits that they are behind schedule on exiting from their first PE fund, but assures that they will be accelerating their pace. “We have sold around 35% of our positions, we should be at about 70%,"he says. Sain then starts giving us an overview of exit plans and the time frame for that. “There is a time to sell businesses. For example, we wanted to ensure that in a company like Centrum (Capital), we had strong leadership and management. With Jaspal Bindra showing up and putting his own capital into the business, we are confident that Centrum will go to a new level," he says. Selling for the sake of selling is not on. Sain points out: “We have time. Over time we will sell our stake and we want to leave the businesses stable and in good hands. “VLCC has filed for an IPO (initial public offering) and that business has performed well for us despite the fact that most of its peers have blown up. It’s the clear market leader with a strong new CEO in place. McKinsey recently conducted a full strategic review and the company is in the midst of implementing the suggestions. “We have a few businesses that are behind but we will find a way and exit them," says Sain. For him, Everstone Capital Management has gone beyond PE. It’s almost akin to an e-commerce company where technology is the underlying enabler. PE just serves as a conduit for it to achieve its ambitions of owning and building food businesses, real estate parks, industrial warehouses and so on. “Don’t think of us as a traditional private equity player. We are probably among India’s top restaurateurs, we are one of the largest real estate developers, we are among the top 10 financial services houses, we are the top educational publisher, etc. We look at our platforms and businesses through a competitive and strong operational lens," says Sain. What also helps them achieve such goals is that their capital is flexible. Sain says: “We are not a sole India-focused fund where every company we buy must be in India. We have a lot of flexibility in our strategy and look for businesses which can benefit from a nexus with India and South-East Asia. Buying a business in the US and bringing the back-end to India is as exciting for us as buying a business in India and then exporting its goods or services to the US. “In our first fund we bought Faces, a Canadian colour cosmetics brand. Many years later, the brand is called Faces Canada, but India is its largest market. We also own a majority of Burger King and Domino’s in Indonesia and Harry’s in Singapore but a lot of the procurement decisions or which beverage partner we think is best are all centralized and synergized," he adds. With over $3.3 billion in equity investments and a lot more using debt, Sain’s firm is also a significant foreign direct investment contributor to the country. “The business environment has improved a lot for us and we feel it at the ground level, especially in terms of business ease and local governments wanting to do the right things. In terms of our interactions with state and central governments, there is a keenness to bring in long-term stable foreign capital. And, of course, as the largest player in warehousing and logistics facilities, GST is going to be a big positive for us," he says. “Talking purely economically, this government is doing a great job. That gives us the confidence to continue to deploy larger and larger pools of capital. I expect us to be even more aggressive in terms investing over the next five years, much more aggressive than what we have been in the previous five years," says Sain. What next? “More of the same," he adds.